MySupps 100% Dextrose provides athletes with rapid and easily available energy in a powder form – ideally suited for straight after training. In addition to endurance athletes in competitive phases, strength athletes can also benefit from the concentrated carbohydrate supplement MySupps 100% Dextrose as the muscular energy reservoirs may be exhausted faster in periods of physical exertion. 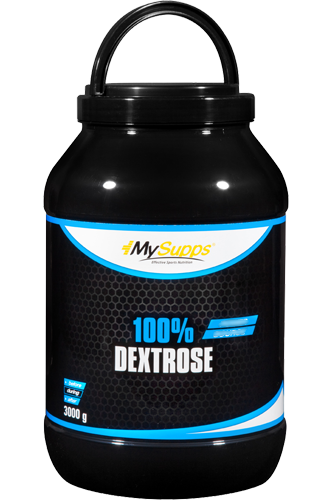 MySupps 100% Dextrose can help to replenish the drained energy reservoirs directly after endurance training and hence supplement a carbohydrate-rich athlete´s nutrition. The quantity of energy consumed should always be tailored to the sporting activity. If training is intense, the daily nutrition can certainly be just as rich in energy. However, the maximum dosage of dextrose should not be exceeded. 40 to 60 grams of dextrose powder can be taken before and after training. During the competitive phase, it is sensible to spread this dosage evenly across the most strenuous periods of exertion. The powder can be prepared in water, milk or other shakes. Worth knowing: Why are carbohydrates so important for endurance athletes? Essentially, our diet provides us with the main nutrients proteins, fats, carbohydrates and fibre, which supply the body with energy. We become prematurely exhausted if insufficient quantities of carbohydrate are consumed, thus leading to an unwanted deterioration in performance. Energy is used mainly to produce heat, in digestion, nutrient transport and in the cerebral and muscular activities. In endurance sport, prolonged muscular activity leads to rapid drainage of the energy reservoirs, which are quickly exhausted in the muscles and the liver. This is why during marathons, for instance, sugary drinks or foods are offered at supply stations every few kilometres. This helps keep stability in the muscles´ energy metabolism, blood sugar and performance level. Many endurance athletes mix their own beverages by adding 60 to 80 g of dextrose and 1 g of common salt to a tea or a fruit juice spritzer. MySupps 100% Dextrose is among the typical carbohydrate supplements for endurance athletes, offering good solubility. Additionally, endurance athletes require greater quantities of carbohydrates during the phase of high training levels, significantly more than the general population or even strength athletes. This means that endurance athletes need to take 5 to 10 g of carbohydrate per kilogramme. If time is short around training, MySupps 100% Dextrose can contribute to covering the increased need for carbohydrate in athletes´ nutrition. MySupps 100% Dextrose can be a good help in nutrition, especially during prolonged endurance units or in the event of a loss of appetite after intense endurance training. Worth knowing: Why are carbohydrates so effective for strength athletes? MySupps 100% Dextrose provides pure dextrose, known as readily available simple sugar. Unlike other carbohydrates such as potato, rice, noodles and whole-grain bread, dextrose does not have to first be broken down in the small intestine, hence meaning that the dextrose reaches the bloodstream faster. This makes dextrose a rapid provider of energy and ideal for any constraints of time around training. Strength athletes appreciate the benefits of rapid, simple sugar. The high glycaemic index of simple sugar especially leads to a rapid rise in the blood sugar level, thus releasing greater quantities of insulin into the bloodstream. Insulin is described as an anabolic hormone, as it is considered also responsible for the transport of nutrients into the muscular tissue. Many strength athletes and bodybuilders wish to build up more muscle mass and generally only take protein shakes around training. The combination of MySupps 100% Dextrose means that proteins and carbohydrates can be transported more effectively into the muscular tissue as a result of the insulin level. Another term is glycogen, found in the liver and in the muscles. Muscular glycogen is mainly burned off during moderate to extreme exertion. In strength sports, the short, repeated exertion leads equally to a rapid depletion of muscular energy reservoirs, which is why carbohydrate-rich nutrition is needed before and after training. As a supplement, MySupps 100% Dextrose can support carbohydrate-rich nutrition and also the greater daily energy balance during the build-up phase. Also, when energy levels are low, MySupps 100% Dextrose can supply the muscles´ energy metabolism rapidly with sugar in order to bring the desired training performance. Not least, carbohydrates such as MySupps 100% Dextrose also influence the protein metabolism by ensuring that the body is not required to draw on other endogenous emergency reserves in the event of exhausted glycogen reservoirs. What products can I best combine with the My Supps 100% Dextrose? With a whey protein shake to promote muscle build-up: e.g. Body Attack Extreme Whey Deluxe. With glutamine products for faster regeneration:e.g.Body Attack 100% Pure Glutamine Powder. With a mineral product to maintain blood sugar stability: e.g. Body Attack Mineral Booster. With a creatine product one hour before training to build-up strength and muscle mass: e.g. Body Attack 100% Creatine.